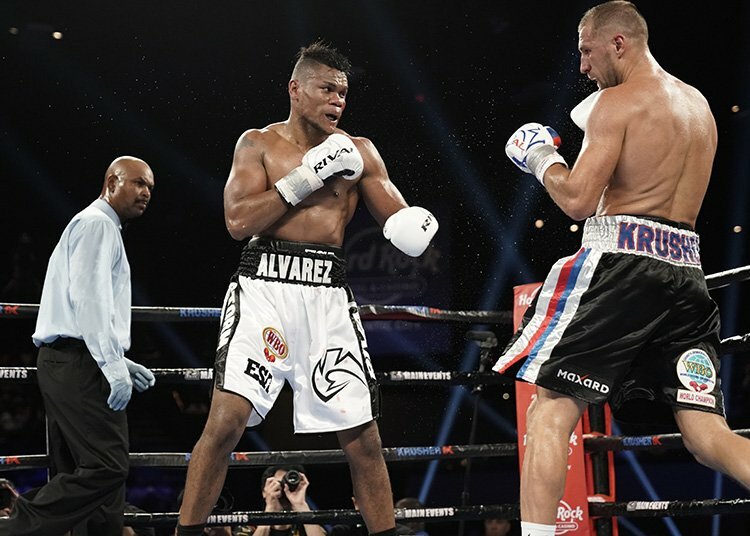 One of the hottest fighters in the light-heavyweight division, if not in all of boxing, due to his sensational dethroning of WBO 175 pound ruler and former pound-for-pound entrant Sergey Kovalev, unbeaten Colombian Eleider Alvarez is planning on building on his stunning upset win with a quick return. The word is “Storm” Alvarez will fight next on December 8 and there is the possibility the new champion could face Kovalev in a return or reigning WBA light-heavyweight champ Dmitry Bivol. Kovalev – who managed to come back from his stoppage loss to Andre Ward, regaining the WBO belt – may or may not decide to exercise the rematch clause that was in place ahead of Saturday’s fight in Atlantic City, but if he does, Alvarez says he is happy to fight the Russian puncher again (or is Alvarez the puncher between these two now?) Bivol, also unbeaten and a big-hitter, was to have fought Kovalev in a unification had “Krusher” done the business on Saturday, but now we could get Alvarez-Bivol instead. From a fan standpoint, though a return meeting between Alvarez and Kovalev would be interesting – did Alvarez catch something of a fluke, can Kovalev bounce back from what may have been the proverbial bad day at the office – it’s likely most people would get more pumped up over a unification between the two unbeaten champions. Another possibility, more than likely a vague one, is an Alvarez-Adonis Stevenson fight in December. The WBC champ has seemingly wanted nothing to do with Alvarez, but now that the Colombian is a belt-holder, who knows, maybe “Superman” will like the idea of a unification fight of his own. Either way and whoever he fights in December, it will be good to see Alvarez, an exciting, fast-handed and very talented fighter, back in action just four months on from his huge breakthrough fight. Might Alvarez, 24-0(12) be the best light-heavyweight in the world right now? One thing is definite: the current 175 pound division is all of a sudden crammed full with potentially thrilling match-ups.